The early registration deadline and hotel cut-off date for the 2007 Agri-Marketing Conference, “Think Big,” is this Wednesday, March 21. Make your reservations on or before March 21 to ensure the early registration rate and secure a hotel room. Registration rates will increase after March 21 and hotel reservations made after that same date are subject to higher rates and potential unavailability.Register now for the agri-marketing event of the year at http://www.nama.org/amc/register.html or call the NAMA office to register at 913-491-6500. Donations are needed for the 2007 Silent Auction that will be held during the Connection Point trade show, April 11-12. The deadline for submitting donations to be included in the Silent Auction catalog has been extended to March 21.The success of the ABEF Silent Auction proves our association is eager to contribute to the growth and enhancement of the profession of agri-marketing. Please show your support and donate what you can (minimum of $50 value suggested). All proceeds from the auction benefit NAMA’s Student Careers Program. If you’d like to make a donation to the Silent Auction visit, http://www.nama.org/abef/silentauction/pledgeform.htm. The On-Line Auction will take place on the NAMA web site at http://www.nama.org/abef/silentauction/bid-index.html, beginning this Wednesday, March 21 and lasting through Wednesday, March 28. Don’t Miss Your Chance to Win a Video iPod! Time is running out on your chance to win a video iPod! 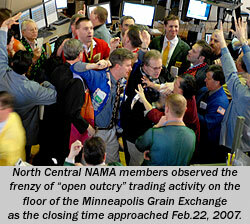 New members who join NAMA between January 1 and April 6, 2007, will be entered into a drawing for a 30 GB Video iPod. In addition, existing NAMA members who recruit these new members will also be entered into the drawing. Just make sure when you recruit a member that they put your name in the “referred by” space on the membership application.The drawing for the iPod will take place at the Connection Point trade show Closing Reception on Thursday, April 12, at the 2007 Agri-Marketing Conference, but you need not be present to win. Start recruiting members today and take home your new iPod after the conference! The deadline to sign-up for the ABEF Golf Tournament is Tuesday, March 27. The golf outing will take place Tuesday April 10 at Bear Creek Golf Course in Dallas, TX. A chartered bus will leave the Hyatt Regency Crown Center at 11:30 a.m. to take everyone to the golf course. Tee time begins at 1:00 p.m. and a golf awards ceremony and reception will follow the outing at the golf course. The price is $125 per golfer. Register on-line now! Just visit http://www.nama.org/amc/golfregister.htm. Proceeds from the Golf Outing will benefit the Student NAMA Careers Program. Show your support of ABEF and be a sponsor of the golf outing. To sign up for a sponsorship on-line visit http://www.nama.org/amc/golfsponsor.htm or contact Jenny Pickett at 913-491-6500 or via e-mail at jennyp@nama.org. The celebration of National Ag Day began on Thursday, March 15, with a luncheon on “The Convergence of Food and Fuel” at the National Press Club in Washington, DC. Over 250 guests, including representatives from agricultural producers, commodity organizations, and agribusiness representatives, government dignitaries, FFA, 4-H and other youth groups and friends of agriculture joined in the celebration. Orion Samuelson, WGN Radio/RFD-TV, was the master of ceremony for the event. U.S. Congressman Collin Peterson, Chairman of the House Agriculture Committee, was the first speaker at the luncheon. Congressman Peterson has been recognized for his tireless efforts on behalf of the agricultural industry by receiving awards such as the “Friend of Farm Bureau” award from the American Farm Bureau Federation and the “Golden Triangle Award” from the National Farmers Union. Following Congressman Peterson’s speech, attendees feasted on lunch courtesy of the National Pork Producers Council. After lunch, U.S. Secretary of Agriculture Mike Johanns took the stage to address luncheon attendees. Johanns remarked that the future of American agriculture looks promising because of Farm Bill proposals that are focused on a market-based system. Johanns said that although some of the proposals in the Farm Bill may not be easy for some of those in agriculture, he is optimistic. According to Johanns, farm cash receipts are expected to reach $259 billion in 2007, which is up $20 billion from 2005, and up $16 billion from 2006. Demand for food and fuel is high and agricultural exports have soared to $78 billion, a $9.3 billion increase in just one year says Johanns. He says that 95 percent of the world’s population lives beyond the U.S. border and that the middle-class outside the U.S. will double by 2020 which means these consumers will eat more as their incomes rise. Following remarks by Secretary Johanns, Krista Knigge, Case IH, presented LaTasha Cote, 12th grader from Couch High School in Mrytle, MO with a $1,000 prize for her winning Ag Day Essay on “American Agriculture in 2025.” The contest was sponsored by Case IH with support from The Council for Agricultural Science & Technology, High Plains Journal, the National Association of Farm Broadcasting, the National Agri-Marketing Association, Country Living Association and McCormick Company. Following the National Ag Day Luncheon, National FFA President, Beau Williamson hosted a rally at the USDA’s Whitten Building patio. The rally showcased the future of renewable energy and American agriculture and featured remarks by Secretary Mike Johanns as well as Greg Webb, ADM Public Affairs, and Bob Dinneen, Renewable Fuels Association. The Minneapolis Grain Exchange (MGEX) hosted North Central NAMA at a February 22 luncheon meeting at their landmark downtown site. More than thirty agri-marketing professionals and student members in attendance watched a video explaining the history and current activities of Minnesota’s only remaining commodity exchange. Following that introduction, the group made their way to the balcony overlooking the trading floor to observe the frenzied “open outcry” action as the day’s closing bell neared. After the day’s close, the group toured the museum area for a close-up look at memorabilia and photos from the Exchange’s early days when actual grain samples were brought onto the trading floor for inspection. A non-profit membership organization, the MGEX celebrated its 125th anniversary in 2006. Since that event last fall, the ethanol phenomenon has brought investment funds into the commodities markets and created renewed interest in trading and the exchange, resulting in member seats on the MGEX trading at new record price levels almost daily. In fact, it was announced that another exchange seat had been sold for a six-figure sum during the time the NAMA members were lunching that very day! Special thanks to Nancy Krull, MGEX marketing manager, for making tour arrangements with the programs committee. Early Registration Deadline One Week Away! 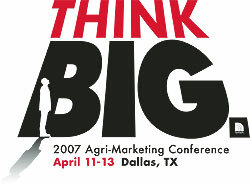 The early registration deadline and hotel cut-off date for the 2007 Agri-Marketing Conference, “Think Big!”, is March 21. Make your reservations before March 21 to ensure the early registration rate and secure a hotel room. Registration rates will increase after March 21 and hotel reservations made after that same date are subject to higher rates and potential unavailability. Register now for the agri-marketing event of the year at http://www.nama.org/amc/register.html or call the NAMA office to register at 913-491-6500. Conference Sessions Will Get You To Think Big! The 2007 Agri-Marketing Conference will stretch your imagination and open doors to innovative ideas. You’ll be better equipped to embrace change, growth, and new business opportunities. This year’s conference will challenge you to step out of the box, take new risks, help you achieve success – professionally and personally – and to revitalize your life! Start Wednesday afternoon with a pre-conference workshop from 1:00 – 3:00 p.m., “Presenting Ideas with Power,” by Laurie Richards, Laurie Richards & Associates. You will learn how to make a more powerful presentation to clients, customers, and employees, regardless of your experience or level of development. Come early to take advantage of this bonus workshop. To reserve your spot for the pre-conference workshop visit http://www.nama.org/amc/reserveworkshop.htm. You won’t want to miss Thursday morning’s Opening General Session from 9:00 – 10:30 a.m., featuring a magical, thought provoking key note address by the Wizard of Ads, Roy Williams. His presentation titled, “The Wizard of Ads Reveals the 12 Most Common Mistakes in Advertising – and the Secret Formula for Success!” will teach you the 12 things not to do when developing a marketing campaign. He will then show you how to capture the hearts and minds of your customers with creative communications tips and techniques. Then on to the Second General Session from 11:00 a.m. – 12:30 p.m., with keynote speaker, Scott Deming, presenting “The Brand who Cried Wolf – Deliver on your Company’s Promise and Create Customers for Life.” Once you’ve created the “brilliant” marketing communications strategies, how do you create the ultimate customer experience? How do you effectively build your brand and turn your customers into evangelists for your products? Kick-off Thursday afternoon with one of four breakout sessions from 2:00 – 3:00 p.m. Menno Ellis, ABA Consulting will present, “Optimizing the Client/Agency Relationship.” He’ll cover the process of determining and communicating expectations, building the relationship from the start, and common reasons for conflict. Susan Lintonsmith, Horizon Organic/WhiteWave Foods, will speak on “Organics as a Marketing Strategy: The Growth of a Trend.” Lintonsmith will explore what exactly defines “organic,” and how will potential USDA action on defining organic impact the industry. Lyle Orwig, Charleston/Orwig, will lead a panel discussion on “Marketing WITHYour Customers-Part A.” Panel members include: Julian Aldridge, Ammo Marketing; Dave Rhylander, Monsanto and Stacy Norin, Elanco Animal Health. This panel of experts outside of, and within, agriculture will share their experiences in developing both business-to-consumer and business-to-business solutions. “Rural Lifestyle Producers: Understanding Who They Are and Why They Buy,” is the last breakout session from 2:00 – 3:00 p.m. This session will feature the results of a study commissioned by the National Association of Farm Broadcasting (NAFB) to define and gain an understanding of this important market. The study, conducted by AMR, involved more than 2,000 interviews in 48 contiguous states. In addition to these breakouts, there is a Senior Management Workshop, hosted by Second General Session speaker, Scott Deming. In this interactive workshop, targeting senior marketing management, you will learn solid, practical methods and processes to help separate your organization from your competitors. Only a few spots are left for the Senior Management Workshop, reserve your spot now at http://www.nama.org/amc/seniorworkshop.html. After a refreshing break, the concurrent breakout sessions continue from 4:00 – 5:00 p.m. with “Rural Lifestyle Marketing-Straight From the Horses Mouth.” Hear straight from the “horse’s mouth” from various segments of the rural lifestyle group the information they crave and how they decide to make purchases related to their “farm or land.” Jay Akridge and Joan Fulton of Purdue University will present, “Marketing WITH Your Customers – Part B.” Akridge and Fulton will unveil recent results from research of four independent Customer Experience Marketing Strategies to show how effective these approaches are in the market place with various audiences. Jan Johnson, Millennium Research will host “Agriculture 2020: What Will U.S. Agriculture Be In 15 Years.” This forward-looking session will examine the top trends affecting North American agriculture and provide a snapshot of what farmers and agribusinesses will be like in the year 2020. “Bioenergy 101” will be presented by Tom Slunecka, Ethanol Promotion & Information Council (EPIC). If you know what a DDG is or how to mix a B20, then this session is not for you (although you may learn a thing or two!) Bioenergy 101 is your chance to get in on the ground floor of understanding one of the biggest changes to hit agriculture since hybrid corn from industry experts including Tom Slunecka and Jake Stewart, Organic Fuels. Start your Friday morning with concurrent breakout sessions from 9:00 – 10:00 a.m. Max Armstrong, WGN Radio will lead the panel discussion on “What’s Keeping Senior Managers Up At Night.” This discussion will give you a closer look at the challenges and opportunities they see ahead for American agriculture and the businesses that provide products and services to keep it competitive. Panel members include: Travis Dickinson, VP Marketing, Syngenta; Michael Layfield, Sr. Marketing Manager, Dairy Anti-Infectives, Pfizer Animal Health; and Larry Christenson, Branch Manager, John Deere. Learn “The In’s & Out’s Of Business Etiquette” with Diane Johnson, Livestock Publications Council. As business professionals, all of us have had to attend receptions and banquets. What are things to consider when greeting people, feasting on appetizers and drinking assorted beverages? These and other tips on business etiquette will be presented to help you make people comfortable around you and to leave the best possible impression. Jill Greene, Solutions, Inc., Janet McPherson, Frontier Farm Credit and a representative from Successful Farming/AgricultureOnline, will present “Marketing To Women in Agriculture.” You’ll learn how to modify your marketing approach in unique and engaging ways to reach this important decision maker. Charlie Arnot, CMA Consulting, will present “Best Food Nation-Using an Industry Coalition to Address Key Issues.” As Sir Winston Churchill once said, “A lie gets halfway around the world before the truth has a chance to get its pants on.” That’s the philosophy that caused a group of 18 national organizations who are dedicated to producing safe, abundant and affordable food, to come together to tell the real story of our food system. Learn how this effort, initiated and supported by an industry coalition, has stemmed the tide of criticism of our food industry, and is providing consumers the facts so they can form intelligent opinions. Our closing keynote address on Friday from 10:30 a.m. – 12:00 noon, is something that you will not want to miss! Jenné Fromm will discuss, “Emotional Intelligence and the Power of You.” This inspirational, powerful presentation will help all of us apply the right emotion, at the right time, to allow healthy confrontation, stay motivated, and build trusting relationships. To register for the 2007 Agri-Marketing Conference visit, http://www.nama.org/amc/register.html. For more information on the conference visit, http://www.nama.org/amc. Donations are still needed for the 2007 Silent Auction that will be held during the Connection Point (Trade Show), April 11-12. Find a home for that special edition wildlife print or even those sports tickets and surplus company logo jackets. Or give a media package or services, and support the ABEF at the same time. Any worthwhile product or service will be gratefully accepted. The success of the ABEF Silent Auction proves our association is eager to contribute to the growth and enhancement of the profession of agri-marketing. Please show your support and donate what you can (minimum of $50 value suggested). All proceeds from the auction benefit NAMA’s Student Careers Program. Donations must be made by this Friday, March 16, to be included in the auction catalog. Note: The On-Line Auction will take place on the NAMA web site at http://www.nama.org/abef/silentauction/bid-index.html, beginning Wednesday, March 21 and lasting through Wednesday, March 28. Gather your foursome for fun and networking on the golf course prior to the 2007 Agri-Marketing Conference. The ABEF Golf Tournament will take place Tuesday April 10 at Bear Creek Golf Course in Dallas, TX. Bear Creek Golf Club is among the Dallas-Fort Worth area’s favorite classic golf courses. It has been named among the “Top 50 Resort Courses in America” by Golf Digest and one of the “10 Great Places to Golf” by The Wall Street Journal. Testimony to the challenge, allure, and shot values found on our two distinct layouts – the West and East Courses – Bear Creek has hosted PGA Tour Qualifiers, the Texas State Open, the AJGA National Tournament, the PGA National Golf Series, and NTPGA Sectional Tournaments. A chartered bus will leave the Hyatt Regency Crown Center at 11:30 a.m. to take everyone to the golf course. Tee time begins at 1:00 p.m. and a golf awards ceremony and reception will follow the outing at the golf course. The price is $125 per golfer. The registration deadline for the golf outing is March 27.